Yesterday, I hosted a small group of creative friends at my house, and we explored Disappearing 9 Patch as shown on this site. Yes, I’m venturing into the modern quilt genre. My version was made with Moda fabrics from 1999, and I ended up with a very soft, very romantic looking disappearing 9-patch. Fabric choice is everything with this technique. Batiks would be great, Asian inspired designs, solids, just about anything would look great with this. If you used a large print, I’d cut 10″ squares or larger though, so you wouldn’t lose the design when you quarter the 9-patches. This small piece was made from 6 blocks, and I will make another 3 blocks today so I’ll have a nice sized square. It will be the center for a Comfort quilt. I used 3″ squares as I had a stack of them already cut, but everybody at the meeting was cutting different size squares – all larger. It will be interesting to see how different they will all look. This was really easy, and the delay was caused as I was having problems locating beads in my collection with holes large enough for 2 strands of leather cording to pass through. I had to resort to making some tubular peyote stitch beads – which took a little time to make. 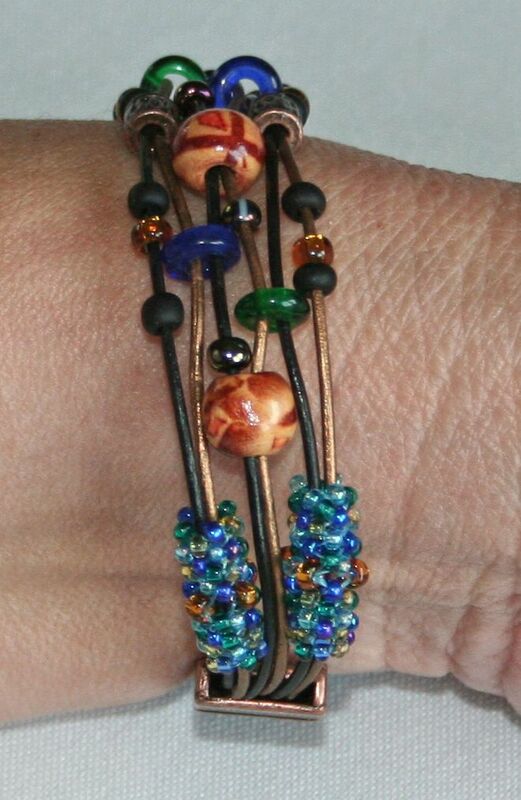 After making two of them I decided if I wanted to wear the bracelet this year, I’d better go bead shopping. JoAnns had the perfect wooden beads on sale, and a few other goodies, so they came home with me – not quickly. Here’s what happened. I purchased the beads, paid for them, got home, and they were not in my bag. I didn’t realize it till 11:30pm. What is it with me and feeling the need to be creative at 11:30pm, but having issues at that time of night? I digress. Of course, I couldn’t sleep after realizing my lovely beads were MIA, so called the store as soon as they opened the next morning. Yup, they had them behind the counter. The sales clerk didn’t put all my purchases in my bag. My husband had our car, so I couldn’t hop in it to go get them. By the time he got home, the store was closed, and then I realized, it was a 30 minute drive to go get those beads, and I’d wait till I had to do other shopping in that area. It was a week before I got back to the store. Then my natural predispostion to procrastinate set in. The only reason this bracelet got finished was because I had to clear the ktichen table for yesterday’s meeting. And that is the end of the story of my very easy to make 6 week bracelet. I can’t stop myself from saying, is that not gorgeous? 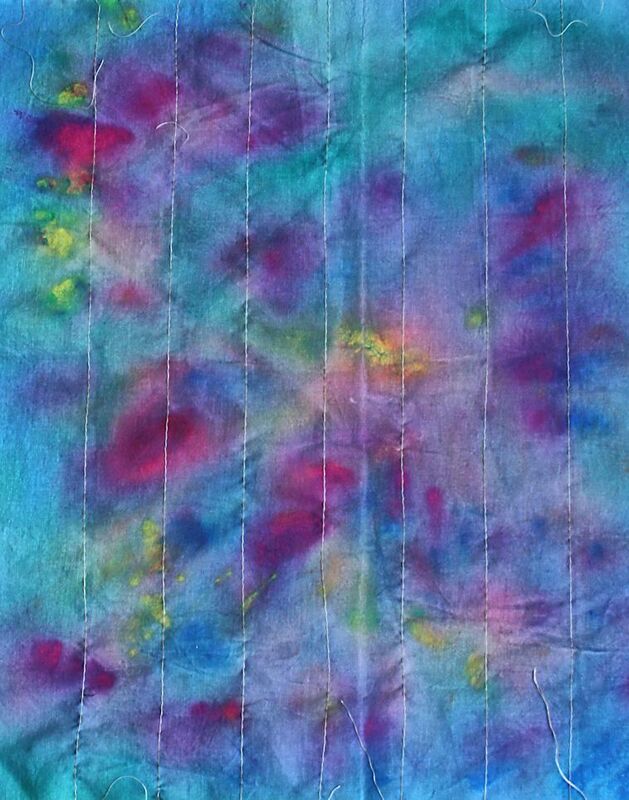 I added soda ash to the thickend dye, and painted on the fabric while it was dry. Then it was wrapped in plastic, and put outside to batch in the sun for 5 hours. There is virtually no color run off when you rinse silk – gotta love that – and the result was the beautiful fat quarter. Now what to do with it? It’s too lovely to go back into the fabric collection, and quite frankly, my fabric collection is going to outlast me. It’s about time I use some of the lovelies. 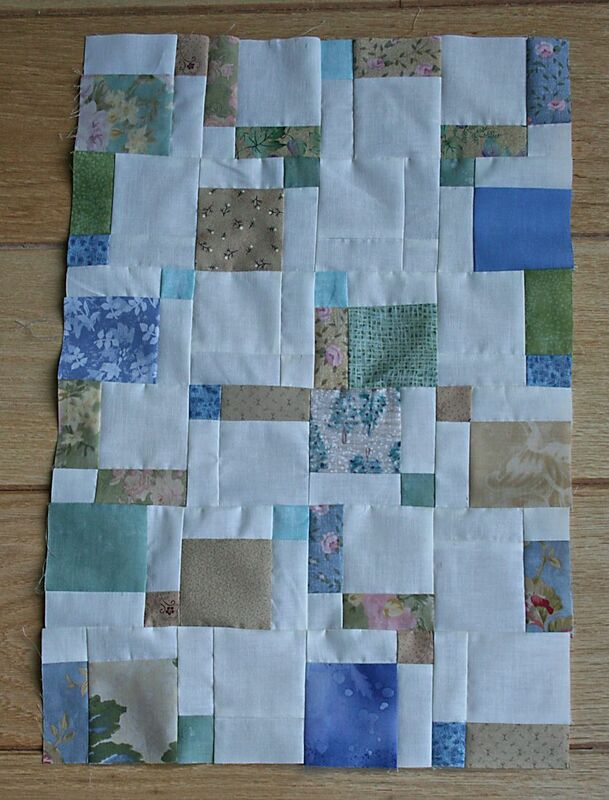 It took awhile to complete the quilting as I used a decorative stitch on my sewing machine. All that double stitching takes longer to complete, but it was worth it. And if anybody will be in the Brockport, NY area, you will be able to see this is person. It will be on display in the A Different Path Gallery from September 5-26, 2014, along with my First in Flight piece. Playing with this fabric is a bit like eating potato chips. You can’t stop with trying one technique. Now I pursposely placed that screen over the lightest part of this dyed fabric, but when it was wet, it was not visible at all. I should have waited for it to dry and then ironed, before I said it disappeared. Live and learn. Please double click on the picture, and look on the right side. You should be able to see the floral design well. 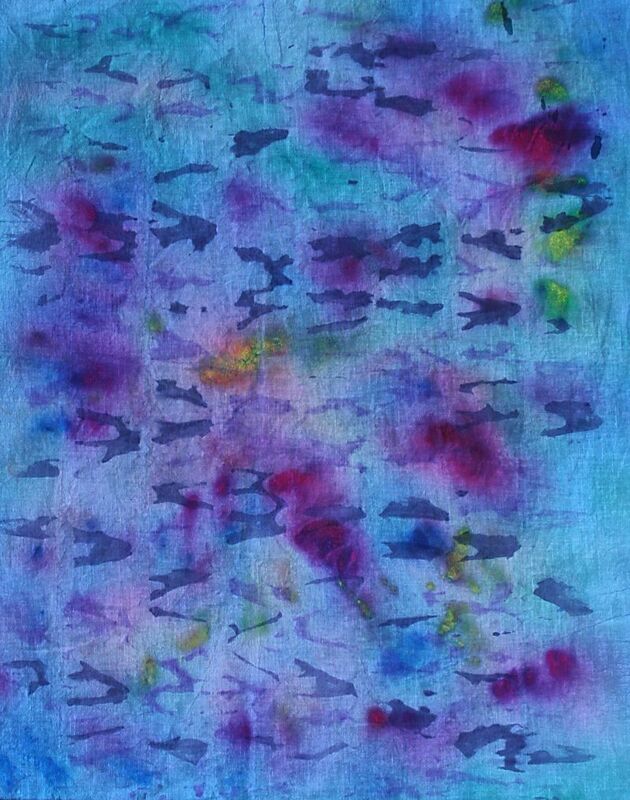 I was very unhappy to discover that soaking this fabric overnight in cold water – to make sure all the screen dye was rinsed out – drastically changed the deColourant Plus colors. If you compare this photo with the one from yesterday, you’ll see the green is almost totally gone, the red is much lighter, and the blue is not visible at all. Now I know that deColourant Plus can’t hold up to a long cold water immersion. This is actually a good thing to learn on this project, because I like this product, and now know what order to use it when putting multiple layers on cloth. I absolutely love the randomness of this. This is a technique I will most likely do again with soda ash soaked fabric and thickened dye. By the way, the white lines will disappear when washed. I use Prismacolor white pencils to draw on dark fabrics, and they wash out easily, leaving no trace behind. Am I done with this fabric? 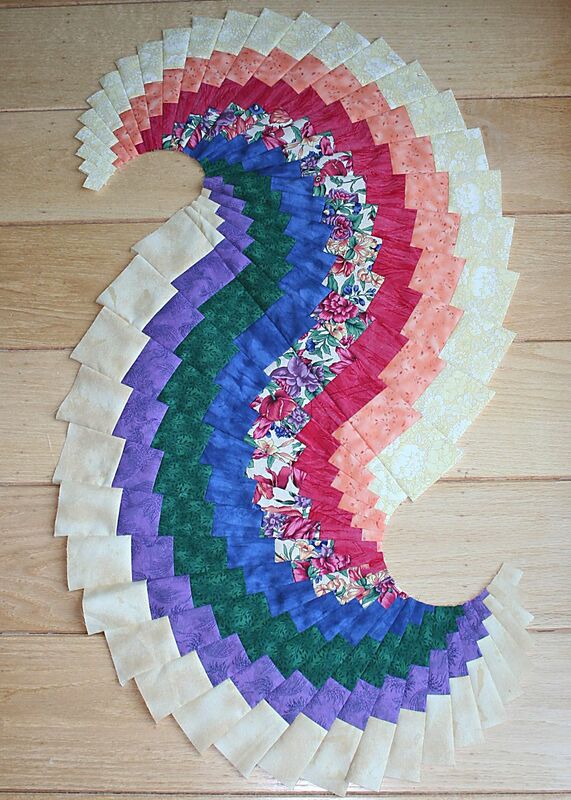 For now, yes, but if I use this is an art quilt, I can see adding some beads, and some thread work. I do love the turquois against this purple, and think it would be lovely with some copper metal, or that gorgeous rose gold look. Sheesh, now that I’m writing about it, you know I’m going to have to try it. This time around, I decided to add color. Some theories were confirmed, and one surprised me. Since I was experimenting with thickened dye paste, I thought I’d also work on some white 480M sateen fabric. The sateen is on the left and the “ugly” fabric is on the right. 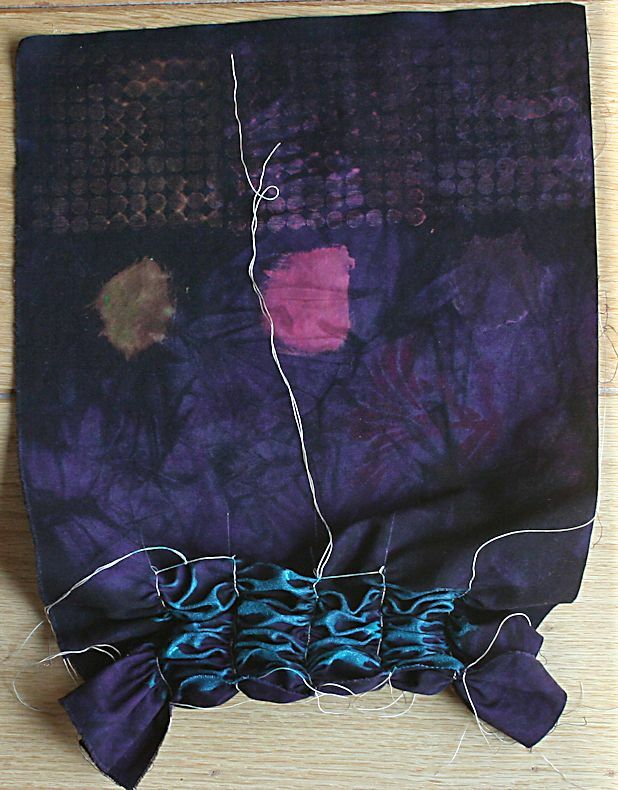 As you can see from the photo – the top row – the emerald and the fuchsia did just fine, but nothing happened with the navy blue. I used a stamp and painted a good sized swatch so you could see the colors clearly. All the bottles were purchased at the same time, but I think the navy blue chemicals expired. Then I moved onto using Procion MX-308 Fuchsia. A dash of that was mixed with 2 tsps of thickened sodium alginate, and 1/4 tsp soda ash. It was pretty thick, so I added a bit of water, and used a katazome screen made years ago. The screen worked great, cleaned up beautifully, and that is the faint floral design you see on the second row of the “ugly” fabric. 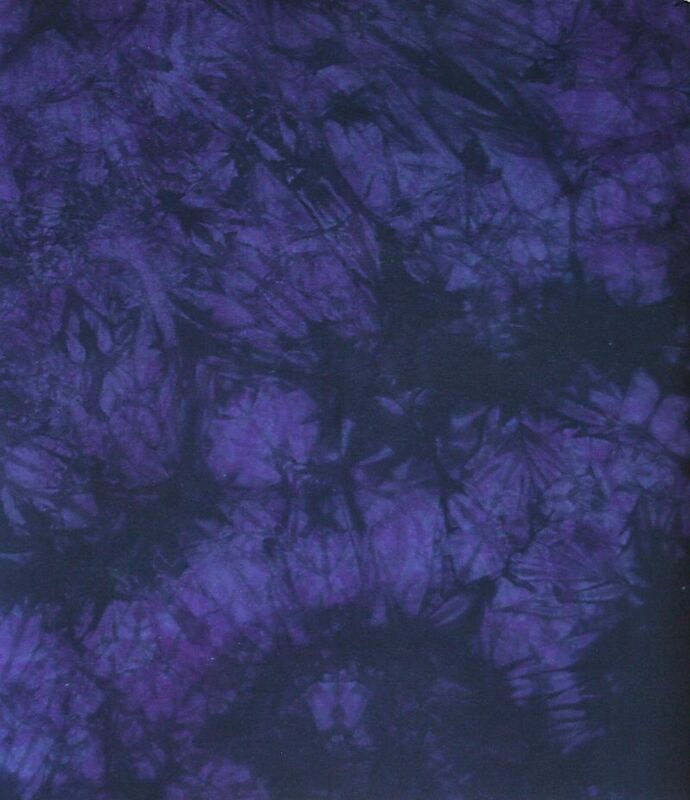 Please double click on the image, as it’s pretty hard to see against the purple fabric. 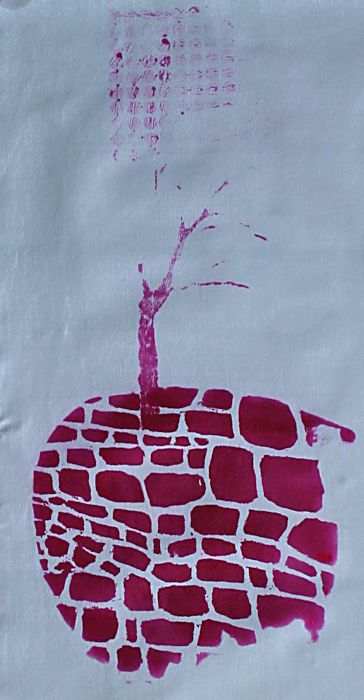 And believe it or not, the same stencil was used with some Aloe Vera gel and 3 drops of Liquitex ink Naphthol Crimson. It showed up when wet, but this photo was taken after it dried. It totally disappeared. That was the big surprise with this experiment as I thought the ink was opaque. 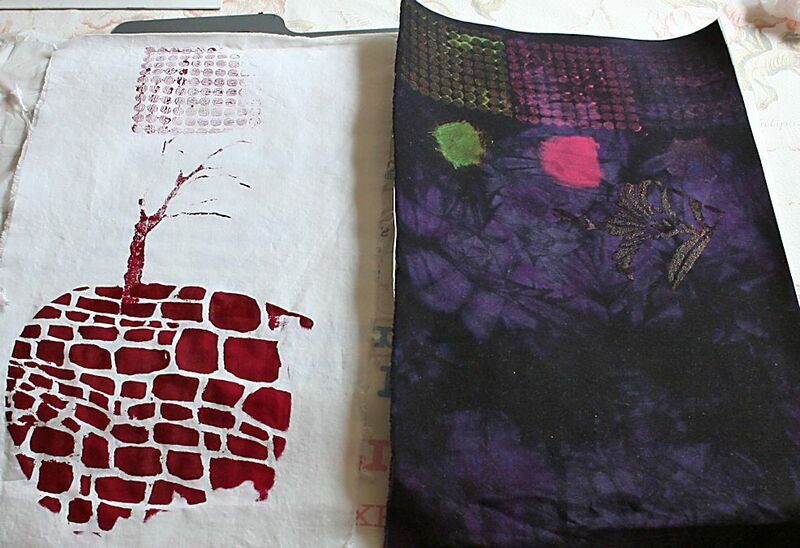 First print was with the same stamp I used with the deColourant Plus, and the second print was with a tree screen I made with sheer drapery fabric sandwiched between interfacing, and sealed with latex paint. It’s not very clear, and I’m not very happy with this screen. It will require a do over. The third print was made with a Mod Podge screen I made a few years ago. This was also made with the same drapery fabric, but Mod Podge was painted around the design, and the print quality is outstanding. Clean up was also a breeze. Big difference in color, isn’t there? I didn’t take a second picture of the “ugly” fabric after it was washed, as I totally lost the dyed floral print. I figured I would, but stubborn head me, had to confirm for herself that you really can’t overdye an already dark piece of dyed fabric with another dark dye. Some of us have to learn the hard way, and others take the wisdom of the dye gurus, and don’t waste their time. 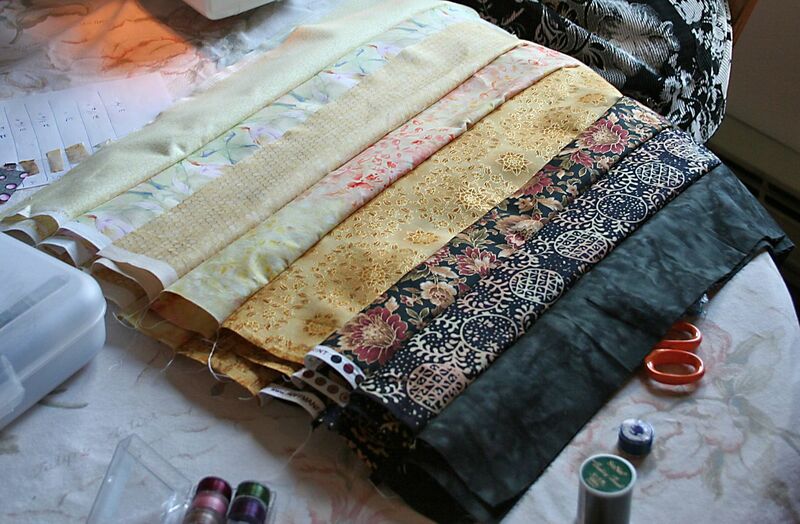 My take on the 2014 Ugly Fabric Challenge was when you get a dark fabric, discharge it, then start layering. 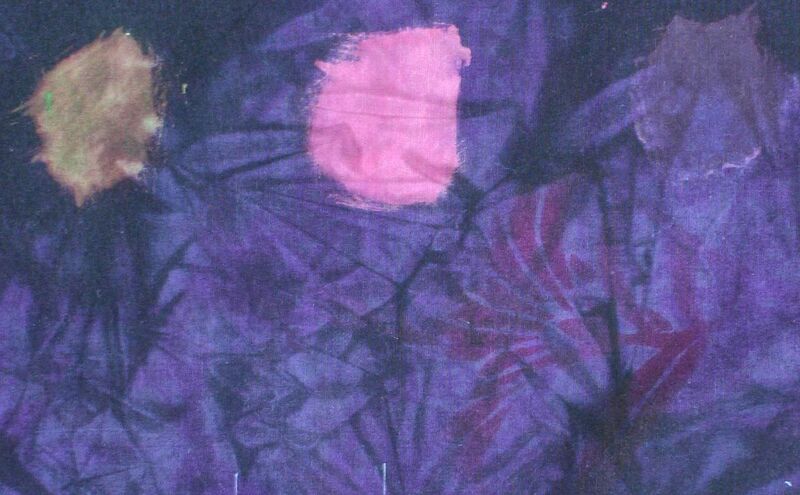 If you want to leave the dark fabric in place, then use OPAQUE paints, and stencil or draw designs all over it. Or texture it with stitching. Hmmm, now that actually sounds like a lot of fun. 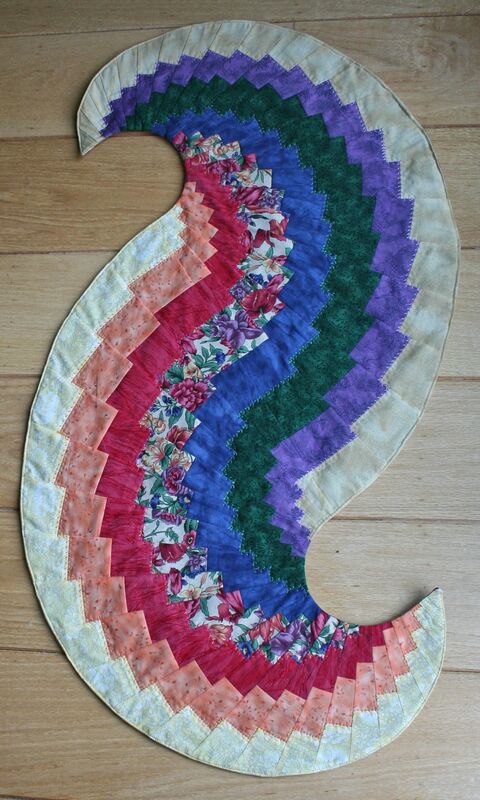 Maybe after my table runner is quilted, I’ll tackle that idea. Sounds like fun, true? Isn’t that gorgeous? I hardly ever get the depth she manages – even when I dye at 10%. This was really an experiment in using 2 discharge chemicals. A few days ago, the entire piece was written on with the Clorox Gel Pen and neutralized with Anti-Chlor. I learned that it’s really hard to get a fine line with the Clorox Gel Pen. You had to squeeze and write at the same time, and there are plenty of blobs on the piece because I flat out don’t have the hand strength to maintain even pressure. No even pressure = no even flow = not great writing. Today I used deColourant and a paint brush. The size of the writing is smaller and much more readable. If I laid just a little deColourant on the fabric, just a little of the color came off. I really like the lighter purple areas in the writing. I had much more control with the paintbrush, and no hand pain. If I put a heavier amount of deColourant on the brush, the color was almost totally removed. I used a dry iron to discharge the writing, and if I had used a steam iron, it would have been even lighter. The “my” on the first line is very light because first I wrote it with the Clorox Gel Pen, then 2 days later, used the deColourant on top of it. Can anybody read the writing? If you double click on the photo it will enlarge for you. Hopefully, some of you will be able to make out what I wrote. A personal side note about what the writing is following, so if you don’t want to read a touchy-feely story, you can stop reading here. I’m blessed to have my 95 year old Dad in my life. He still lives independently, and is a joy to be around. I call him everyday, visit him at least once a week, and this morning he told me the most wonderful thing. He said when I step foot into his home, his heart opens up, and I’m like a ray of sunshine entering. Now 3 days ago, I was wondering what to write on this fabric, and I thought of my Dad. Immediately, the song You Are My Sunshine came to mind. It’s truly amazing that we both think of each other the same way. I couldn’t make up a story like this if I tried, and while I’m trying to be light-hearted about it here, I have to say, he brought tears to my eyes this morning when he told me that. Last week a few friends gathered at my home for a playdate. We each made the same pattern, but with our own interpretation. I post pictures in alphabetical order, but unfortunately, my camera lost the picture I took of Beth’s tablerunner, and she did something really neat. The pattern is made by sewing strips of fabric together to form a strata. Beth eliminated one of the strips to have a larger center and it turned out terrific. I followed the pattern exactly and chose bright colors. It will be assembled differently though. Yesterday, I purchased some wool/rayon felt, and instead of pillowcasing the table runner, I’ll be fusing it to the felt, quilting it, then cut the felt about 1/4″ away from the edge. When it is completed, I’ll post another picture. Her colors are very elegant. She finished quilting hers and you can see a picture of all 4 together on another friend’s blog – another Beth Our group picture is a little way into that post.